We’ve seen numerous reinterpretations of Greece in different spots around the Philippines. While La Bella Boutique and Residences may seem like another addition to the list, tourist swarm the place not just for its familiar and Greek royal blue-and-white architecture, it boasts of the most aesthetically pleasing rooms. One of its most popular rooms would be a shabby chic themed spot. Decked in rustic furniture, wld flowers, and pops of lavender, each corner overflows with personality. All other rooms however also have their unique design and theme. Some are plastered with nautical trinkets on the walls, while others have opted for a scarlet red design all throughout. If the themed rooms aren’t enough to impress you, there are endless locations plotted around the place that could leave you at awe. Many guests quickly fall in love with the quaint and cosy Bodhi library. Aside from the shelves of books and reading nooks, they’ve also got a small terrace filled with comfy seats for readers to plop and get lost in their chosen fiction. The lobby spells clean with an aerial space and minimalist decor. There are striking wood art spread across the halls and room that instantly gives the place character. Meanwhile, amenities such as the pool and roofdeck jacuzzi. Keep in mind however that the hotel building and condotels are located in different buildings, while La Bella Boutique houses its own hotel-like rooms, the themed condotels are considered more of home which you can rent for a few days. 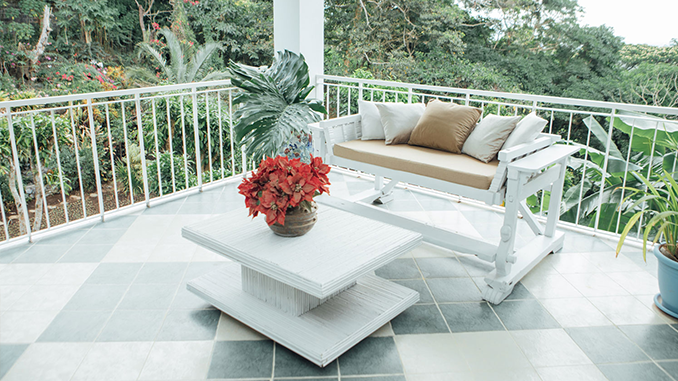 If you’re looking for a vacation home that can fit the whole barkada or family, Pitchpine Tagaytay won’t just impress in terms of size but has every corner of the place filled with photo-ready decor. 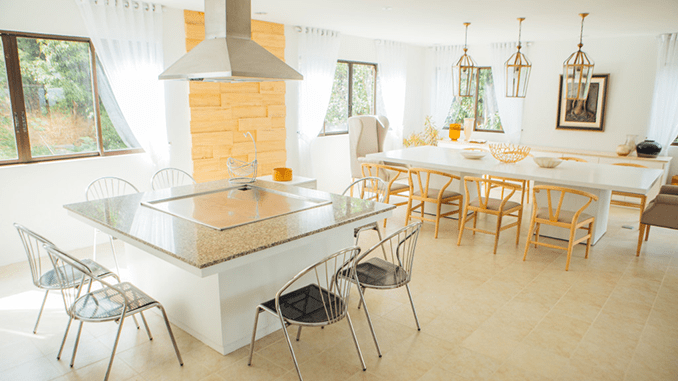 With pops of gold, cream, white and powder blue, the Scandinavian-inspired vacation home can fit a family or barkada of 15. With a home that holds five bedrooms, the place is certainly fit for a big group. The master suite is complete with a four poster bed, its own bathroom, and even a seating area. The other rooms still holds the Scandinavian aesthetic and varies from single to double beds. From bedroom to dining and kitchen, the rental home houses not just a grand dining table, but also has its own Tepenyaki table. So for any family member that can master the Japanese cuisine, the 8-seater table is a good place to show off some skills. Meanwhile, the outdoor lounge deck has multiple seating areas with the most scenic view. Perfect for any late night conversations matched with good grub and plenty of games. It’s a surefire way to cozy up on Tagaytay’s chilly evenings with great company.